Thousands of homes and businesses across Toronto GTA have been tremendously damaged by the recent torrential rainfall and subsequent flooding. Basements, furniture and many ground level dwellings have sustained millions of dollars of damage. Even with the City of Toronto investing tens of millions of dollars into storm water management, back flow from drainage systems and sewers are inevitable. Furthermore, many ground level storage facilities across the city were not spared and also sustained severe flood damage. This left many storage tenants at a loss. Many valuable pieces of furniture and all sorts of items were destroyed. Why take the risk again? Absolutely none of our storage units were compromised. Many of our abroad and local tenants panic called in to inquire about the condition of their storage items in Toronto and we were glad to say they are all still in great condition. Our multi-level facility is practically flood proof. Now the job of restoration begins. Thousands of people are seeking to clear out their damaged basements, homes and businesses. However, the amount of storage units in the city is limited; so don’t wait for your insurance adjuster to give you the go ahead. Reserve your Toronto storage unit with us now. Ever wonder why insurance companies recommend above ground climate controlled storage facilities like Jiffy Self-Storage? They are mitigating their risk of loss due to water seepage and blocked sewers. Ensure that your belongings will be far from backed-up drains and smelly mildew basements. Powerful and dangerous thunderstorms in Southern Ontarioare unpredictable and can result in catastrophic damage to your property. Do not take your stuff and further risk your goods to ground level storage facilities. Having peace of mind when storing your belongings is worth a lot more than the cost of storage. Did you know that Jiffy Self-Storage is the only Toronto Self-Storage Company winner of the Consumer Choice Award, has a perfect record of zero complaints with the Better Business Bureau and has achieved the highest possible rating of A+ with the BBB? Check the BEST first. Store your stuff at Jiffy Self-Storage! Thousands of homes and businesses across Toronto GTA have been extensively damaged by the recent torrential rainfall and subsequent flooding. 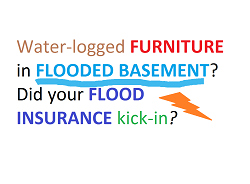 Basements full of furniture and furnishings and many ground level dwellings sustained millions of dollars of damage. Even after the City of Toronto having invested tens of millions of dollars in storm water management upgrades, extensive back flow from flooded drainage systems and sewers were still evident in the storm catchment area. Furthermore, many ground level, single storey storage facilities across the city were not spared and also sustained severe flood damage. This left many storage tenants at a loss. Many valuable pieces of furniture and all sorts of items were destroyed. Why take the risk again? Absolutely none of our storage units were compromised due to flood damage. Many of our abroad and local tenants panic-called to inquire about the condition of their storage units in Toronto and we put them at ease by saying that all our tenants’ stuff had been spared and are all still in great condition. Our multi-level Toronto storage facility has proven again that it is extremely flood resistant. Powerful and dangerous summertime thunderstorms in Southern Ontario are unpredictable and can result in catastrophic damage to your property. Do not take your stuff and further risk your goods to ground level storage facilities. Having peace of mind when storing your belongings in multi-storey facility is worth a lot more than the cost of storage in single storey storage facility.